Meteor Crater near Winslow, Arizona is a favorite tourist stopover, but also a less-than-gentle reminder that Earth is in the strike zone of large space rocks. The space rock that carved Meteor Crater in Arizona hit the planet much more slowly than astronomers once figured, but still 10 times faster than a rifle bullet. The new analysis, announced today, explains why there's a lot less melted rock in the crater than expected. The mystery has dogged researchers for years. The big hole in the ground -- 570 feet deep and 4,100 feet (1.25 kilometers) across -- was blown into existence 50,000 years ago by an asteroid roughly 130 feet (40 meters) wide. Previous calculations had the rock slamming into the ground at no less than 34,000 mph (15 km/sec), based in part on the expected speeds of large meteors in relation to Earth. Such an impact ought to have generated more melted rock in and around the crater than what's been found. A new computer model, reported in the March 10 issue of the journal Nature, shows the incoming object would have slowed considerably during its plunge through the atmosphere, part of it breaking into a pancake-shaped cloud of iron fragments prior to impact. About half the original 300,000-ton bulk remained intact, smacking the planet at about 26,800 mph (12 km/sec), said the study's lead researcher, Jay Melosh of the University of Arizona. Meteor Crater, a popular tourist destination, was the first scar on Earth confirmed to have been gouged by a rocky visitor from beyond. 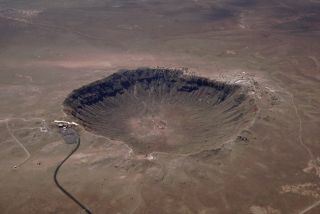 "It's probably the most studied impact crater on Earth," Melosh said. "We were astonished to discover something entirely unexpected about how it formed." The modeling is based in part on investigations decades ago by Daniel Barringer, whose name is officially associated with the crater. Barringer and others found chunks of the iron space rock weighing from a pound up to 1,000 pounds in a 6-mile-diameter circle around the crater. The new work also draws from an improved understanding of how Earth's atmosphere cushions extraterrestrial blows. In 1908, a good-sized asteroid -- more stony in nature -- exploded above the surface of Siberia, flatting hundreds of miles of forest but leaving almost no extraterrestrial trace. During the satellite era, scientists have monitored car-sized space rocks routinely exploding in the air. "Earth's atmosphere is an effective but selective screen that prevents smaller meteoroids from hitting Earth's surface," Melosh explained. The effect of screaming through the air, even for an iron-heavy meteorite like the one that struck Arizona, is a lot like hitting a wall, Melosh said. And many space rocks are already cracked before they arrive, scientists believe. "Even though iron is very strong, the meteorite had probably been cracked from collisions in space," Melosh said. "The weakened pieces began to come apart and shower down from about 8.5 miles (14 kilometers) high. And as they came apart, atmospheric drag slowed them down, increasing the forces that crushed them so that they crumbled and slowed more." The results evolved out of a project in which Melosh and colleagues developed a "Catastrophe Calculator" that predicts the effects of asteroids of varying size and composition striking any given location on the planet.